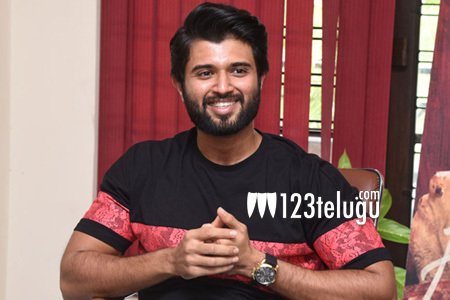 Post the success of Arjun Reddy, Vijay Devarakonda is doing multiple projects in both Telugu and Tamil. Today, he met the press and spoke about each of them in detail. Here is the transcript. What kind of change did Arjun Reddy’s success bring in you? I have changed from time to time. Depending on situations, I keep changing all the time. Off late, I have become a lot wise in selecting my scripts. Post the success of Arjun Reddy, I was working on a film in the production of Geetha Arts. That is the time, I received a call from Swapna regarding Mahanati. With no questions asked, I agreed to do the film as I share a close relationship with Swapna and Nag Ashwin. Heard that you were the first choice to play Gemini Ganesan? Yes! as Dulquer couldn’t adjust his dates, I was ready for the role but with a bit of reluctance. As Dulquer sorted out his dates and okayed the film, I felt happier as he is the perfect choice for that role. Tell us about your next film Taxiwala? The film is a complete fun thriller where I play a taxi driver who goes through all sorts of problems. How does he come out is the whole story of the film all about. Any plan to do Hindi movies? Doing a Tamil film itself was a bit difficult but as the sensibilities of Telugu and Tamil are close, I managed to do a Tamil film. But doing a Bollywood film is a different game altogether. As of now, I am not ready for it as I have plenty of projects lined up in Telugu. About your role in NOTA? I play a very aggressive politician in the film. The subject itself is quite different and I am very excited about that film as it is my Tamil debut.